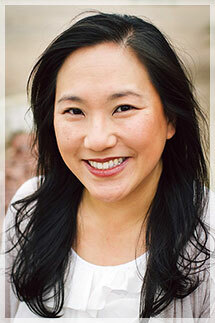 Dr. Kareen Yeung Landerville was born in Canada and raised in North Dakota. She received her bachelor's of science degree in Microbiology from the University of California, Davis in 1995 and completed her optometric training at the Southern California College of Optometry in 2002. Dr. Landerville continued to practice in the southern California area while concurrently pursuing advanced post-graduate study in vision therapy, vision development and rehabilitation. She became a Fellow of the College of Optometrists in Vision Development in 2005. Dr. Landerville moved to Massachusetts in 2006 with her husband and spent several years practicing in New England, being mentored by leading developmental and vision rehabilitation optometrists in the country. She returned to the west with her family to establish the Las Vegas Center for Vision Therapy in 2014. As an optometry student, Dr. Landerville was honored with a Beta Sigma Kappa Honor Society grant for her research in contact lens use. She was also specifically recognized for her leadership skills, and she received the Dr. Erwin A. Rader Memorial Scholarship. Dr. Landerville’s preliminary interest in the science of vision development arose during her time as an optometry student. However, it was participation in a course of vision therapy as a patient that cemented her desire to focus on this field as a health care provider. Following completion of her own treatment program as an adult, she was able to experience detailed stereopsis for the first time in her life. This allowed her to perceive the world in three dimensions. Clouds popped out of the sky, and she was finally able to throw a softball accurately! In addition to her fellowship with the College of Optometrists in Vision Development (she is one of only two COVD fellows in the state of Nevada), Dr. Landerville is board-certified in the treatment and management of ocular disease. She is also a member of the International Sports Vision Association and the Neuro-Optometric Rehabilitation Association. Dr. Landerville is a resident of Las Vegas, where she lives with her husband, daughter, and spunky Golden Retriever puppy named Copley. In her spare time, she enjoys music, hiking, photography, and cheering on the Golden Knights. Enthusiastic and thoughtful, Kristina is one of our vision therapists and provides a fun and rewarding experience for our patients. She has a background in child development and is currently in the process of becoming a Certified Optometric Vision Therapist (COVT). Kristina brings positivity and warmth to our therapy room; she enjoys helping and being a part of the development of visual awareness and self-confidence that our patients undergo through vision therapy. During her personal time, Kristina continues her own education by studying history and music. Cheerful and welcoming, Debbie is one of our vision therapists. She has a background as a public librarian creating youth and family programming, and she utilized a hands-on and interactive approach to foster a love of reading in children. In her free time, she is an active volunteer and author. Debbie is currently collaborating with her artist daughter on an illustrated children's book.